Sam Raimi's shift from an indie horror director to an orchestrator of grand-scale action wasn't abrupt, gradually escalating through the toned-down hero escapades of Darkman and a transition of sorts from terror to raucous undead-killin' with his third Evil Dead film, Army of Darkness. Those who experienced the dusty outlandishness of his previous works probably weren't too surprised to see him tackle the gravitas of westerns with The Quick and the Dead, but on the surface the transition from zombies and jokes about "boomsticks" to a film about high-noon duels and murderous mustache-twirling barons could seem like a big jump. Raimi's gravitas ends up being one of a mixed bag of elements that hit the bullseye in his western, along with a charismatic cast embodying very overt gunslingers in a destitute town. Substance in The Quick and the Dead ends up being as sparse as the town's prospects, though, resulting in a cartoonish bracket of gunslingin' that doesn't shoot as straight as it should with its female protag. Stone plays a solemn, weathered drifter coloquially referred to as The Lady, who's seen ruthlessly abandoning someone chained to a wagon at the beginning of The Quick and the Dead. She's on her way to the town of Redemption, a ramshackle, largely destitute galley of buildings mostly kept afloat by a saloon for passersby, overseen by an eternally greedy and intimidating ex-outlaw named Herod (Gene Hackman). There are few reasons to stop in at Redemption, save two: the key one being a regular shootout contest overseen by Herod, in which the contestants compete for over $100K in cash provided by a nearby bank. 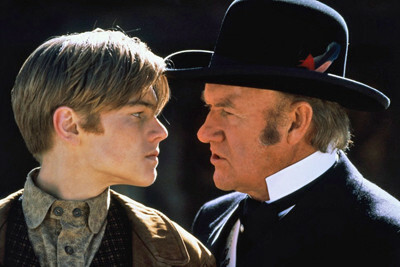 Both the town's regular folks -- including the baby-faced Kid, played by Leo DiCaprio, along with other resident outlaws -- and travels from near and far are roped into the contest, this time including a reformed reverend, Cort (Russell Crowe), once an associate of Herod's. The other reason? Revenge, of course, and that's what The Lady's really after as she gallops into town and stomps into the saloon. The height of The Lady's strength as a heroine in the "Old West" comes early in The Quick and the Dead, when she physically -- and charismatically -- asserts her capabilities to a bartender, demonstrating that she's just as badass as anybody else allowed to stay under the roof of that saloon. It strikes a chord, especially through Sharon Stone's piercing, haunted looks and formidable body language while adorned with a weatherworn duster and sharp black hat, getting the point across that she's skilled enough to accomplish whatever mission she's there to complete. Only as the script begins to play out does the vagueness and inconsistency of her character muck things up, branding her as both a grizzled, enigmatic gunslinger and someone with naivete and inexperience in the ways of killing. Part of this lies in the manufactured mystery of her backstory: while flashbacks reveal the motivation of her revenge from her childhood, they avoid how she got from being a young girl hit by tragedy to a top-notch shooter with hesitation to kill her enemies. That might be an interesting tale … perhaps more so than this one. Instead, The Quick and the Dead concentrates on the drama of battle happening on the streets of Redemption, where tried-and-true characters of all stripes challenge each other to duels in hopes of earning fortune and glory. Between Sam Raimi's amplified, homage-heavy approach and the script's focus on near-caricature contestants, there's nothing at all subtle about what goes down throughout the town, leaving no emotional beats or motivations concealed as character development bounces between father-son issues and religious transformation to outright villainy for villainy's sake. Overuse of those close-ups on shifty eyes from yesteryear's westerns blend with Raimi's affection for Dutch-angled zooms, which creates a highly stylized environment surrounding the myriad contestants, leading to several visible bullet holes straight through bodies. The Quick and the Dead may be packing entertainment value, but its reverence to the genre also comes dangerously close to satire. Like many other lesser films involving the actor, the negative aspects don't get the best of Gene Hackman. Yes, there's very little -- if anything -- understated about Herod as a murderous mayoral villain, a taxing miser and unflinchingly cocky duelist; and yes, the performance demands a bit of scenery-chewin' as he profusely underscores the extent of his wickedness to the citizens of Redemption, just so nobody picks up on even a hint of moral grayness whenever someone desires his death. This isn't a rehash of Hackman Oscar- nominated role as Little Bill in Unforgiven, though: Herod may have the same kind of gristle, but he lets flamboyance and the showmanship of intimidation cover it up, resulting in an almost playful, attention-grabbing antagonist whose exaggerated pomp-‘n-circumstance and passé wicked machinations are anchored by the persuasive menace of Hackman's performance. When the likes of sci-fi supporting legends Keith David and Lance Henriksen unleash their amusingly ostentatious stereotypes of tall-tale outlaws and hired guns, Hackman's there to legitimize the atmosphere. 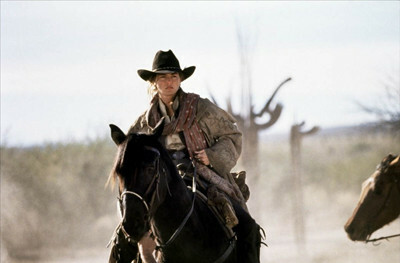 With so many solemn, hard-edged modernized westerns released shortly beforehand -- Unforgiven, of course, but also Tombstone and Dances With Wolves -- it's not unreasonable for The Quick and the Dead to seek out a tone that doesn't take itself quite as seriously, and Raimi's a good directorial pick for that. As the number of gunslingers continues to thin and anticipated conflicts between specific ones grow closer, the momentum never really slows down and the energy doesn't really dissipate, especially as Herod exerts his … uh, executive privilege by shaking up the terms of the contest to his bidding. If sheer explosiveness, gravitas, and crowd-pleasing vengeance were all Raimi needed to execute, then The Quick and the Dead would've simply hit the mark; however, its undercooked characters and impulsive, surface-level dramatics lend it the appearance of being a lesser incarnation of the contemporary state of the subgenre. Best to view Raimi's western similarly to Redemption's shooting contest itself: a meeting point for talent with little on its mind beyond the quickness of the draw and the tick of the clock. A series of catalogue releases seem to always be at the forefront of Sony's priorities for new-‘n-improved format releases; I'm especially reminded of the Superbit collection of DVDs, which included Raimi's Spider-man films along with several other vivid audiovisual triumphs (a pair of Luc Besson films, a pair of Jim Henson creations, the Men in Black). 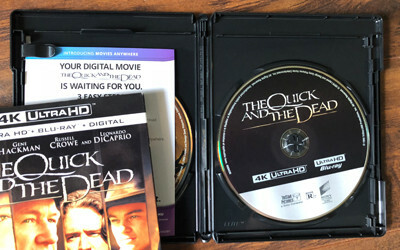 The Quick and the Dead has galloped along with those other releases at varying speeds -- it waited until 2009 to show up on the Blu-ray scene -- because it displays dense, attractive "lived-in" production design that accentuates details and heavier contrast that works well with the transfer's black levels. The same can be said for this exceptional 4K scan, even more so, framed at 1.85:1 in a vigorous and satisfying 2160p transfer without any stipulations or footnotes. Textures are impeccable, from the weathered setting -- woodgrain everywhere, age on the clock's face and hands, dusty streets and Cort's stony "prison" at the center of town -- while the chains, leathers, and other textiles of period garments elevate gentler details throughout. Film grain remains heavy, robust, but entirely fitting with the cinematography's appearance. Black levels are tremendously nimble, in line with the enhanced darkness of HDR but more attuned to that all details remains exceptionally visible. Perhaps most impressive, the palette has more subtlety and nuance than previous releases, elevating skin tones and wrangling the heavy tan-leaning color choices. It's a winner. 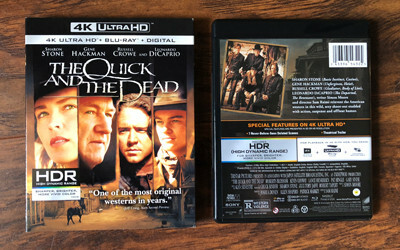 The Quick and the Dead has traditionally also sounded quite strong as well, with the sounds of gunshots, clock towers, and scuffles in the saloon engaging enough of the surround stage and a variety of levels in the high-to-low sound range to create an immersive environment. While it's been a while since I've last heard the nearly decade-old DTS-HD Master Audio track accompanying the Blu-ray release, this Dolby Atmos track doesn't telegraph much more of a sonic experience than what's remembered of my latest viewing: an appropriately clear, intermittently loud, but somewhat dated and lightweight sound engagement. Dialogue stays clean and natural regardless of the environment, though with marginal movement and nimbleness in the front channels. Gunshots and their impact on flesh are potent enough, but possess less crispness and dimensionality than one might expect from an enhanced object-based track. Horses galloping and bar fights have some responsiveness that sprawls out across the stage, though, and possesses enough midrange heft to be satisfying. Explosions -- a notable few late in the film -- also telegraph a fine amount of vigor and expansiveness, but they also seem restrained. Everything's sharp, but also suppressed and sounding like a product of twenty years ago. Suitable, but not on the same level as the transfer. The only extras on the 4K disc are about five minutes of Deleted Scenes (5:15, 16x9 HD), as well as a Trailer (2:18, 16x9 HD); the Blu-ray disc, a duplicate of the 2009 pressing, is bareboned outside of a few previews. 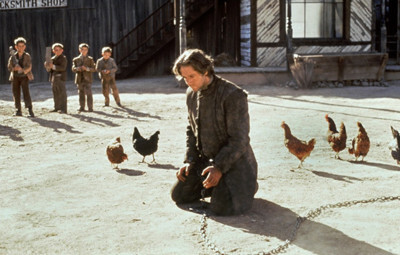 I've seen The Quick and the Dead probably about a half-dozen times since its theatrical release, and Sam Raimi's western has never ceased to entertain with its exaggerated, upfront tale of revenge, redemption, and the theatrics of shooting duels in the Old West. On the surface, Sharon Stone makes for a strong, fierce, almost believable female gunslinger, while Gene Hackman offers up a captivating embodiment of a straight-up dastardly villain. An eclectic grouping of actors -- some in early appearances before their stardom, such as pre-Gladiator Russell Crowe and pre-Romeo and Juliet Leo DiCaprio; others being recognizable veterans in smaller character roles, like Keith David and Lance Henriksen -- strengthen the energy of the shootouts that emerge both in competition and organically, which have absorbing gravitas and theatricality. What it lacks is, well, pretty much anything under the surface, halfheartedly tapping into vengeance, poverty, and being a woman in the times as the entire story hinges on how the tournament plays out. Poor decisions are made and characters are rendered dubious and inconsistent, but that ultimately doesn't take away from how much fun The Quick and the Dead is to watch, really. Sony's 4K Blu-ray looks terrific and sounds quite capable, which earns it a lukewarm Recommendation.